“I love the feeling you get when you play a suspenseful/competitive match. I’ve been looking foreword to it all summer so I hope this year we are able to have some matches like that. Tennis is a competitive, edge-of-your-seat game that is great to play in and when you’re not playing, it is one of the most entertaining sports to watch, and easy to get into. 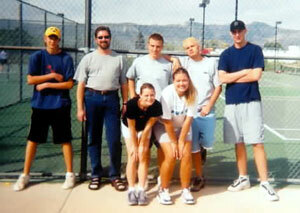 CEU’s first tournament will be hosted by Snow College in Ephraim. It will most likely be held on October 3-4. With budget cuts, Dixie State College has already announced that they will not be able to play in the tournament. Last year Dixie was one of CEU’s main competitors. “We had some good matches against a lot of the schools, Dixie and Snow were probably the matches where we played our best against because they were equally matched, they had really good teams. Our teams were pretty equal in talent so the games got really interesting to watch and play in. It was some ‘dang’ nice tennis being played,” Jarrett confirmed. This tournament has not only been competitive and good for matches but the students also can go expecting to have lots of fun. The positions on the team include three male single positions, three female single positions, two male doubles, two female doubles, and two mixed doubles. Last year students were able to play both doubles and singles. They may do that again this year if they would like. If you play tennis and would like to join, practice is on Mondays at 5 p.m. on the tennis courts on 300 east and 450 north, or contact Ron Vogel at 613-5257 for more information.